G Luke Joeckel vs. DI DeForest Buckner – In their first matchup of the season, Buckner was responsible for nine of the 49ers’ 28 total quarterback pressures. He mostly faced off with Luke Joeckel, and early reports are that he will see him again, in Joeckel’s first action after missing the past five games. In his stead, rookie from LSU Ethan Pocic has been starting at left guard since Week 8 and has left a lot to be desired with his 35.5 overall grade among guards ranking 73rd. In his first start he allowed only two quarterback pressures, only to follow that up with six more in Week 9. That cycle repeated for Weeks 10 and 11 and with Joeckel set to return, he will have his hands full against Buckner, who owns the third-highest pass-rush productivity among defensive tackles this year with an 8.9 and the second-most quarterback pressures with 36. 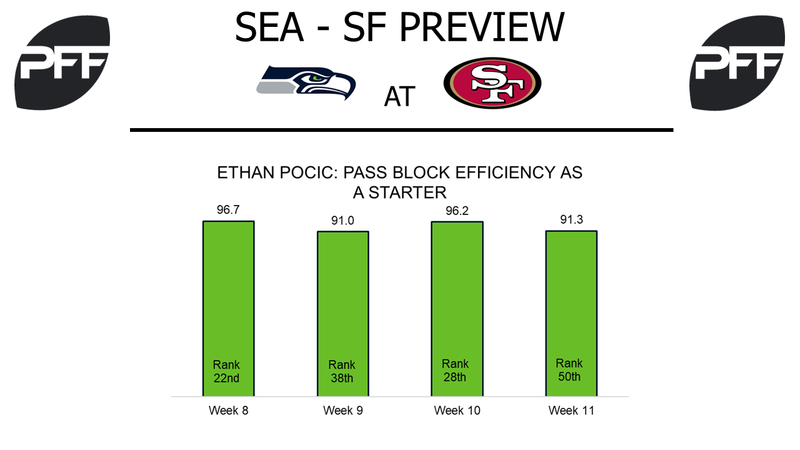 Pocic’s pass blocking efficiency over the past four games shows the struggles, and how big the possible impact of Joeckel’s return could be. TE Jimmy Graham vs. S Eric Reid – Through the first six games of the season Jimmy Graham was averaging a first down or a touchdown on 42.9 percent of his targets, well below the league average among tight ends of 55.7. In three of those first five games the Seahawks failed to score more than 16 points. Since their bye-week, Graham has been responsible for a first down or touchdown on 63 percent of his targets, the 11th highest percentage among tight ends and well above the 55.4 percent league average. Reid has been the primary cover man against opposing tight ends having seen 10 targets, allowing eight receptions for 63 yards, one touchdown, with one interception and a pass defense. His 6.2 yards per pass attempt allowed is the lowest on the team among 49ers who’ve been in primary coverage on a tight end on at least five targets. Seattle Running Backs vs. 49ers Run Defense – Running back Chris Carson has not played a single snap since Week 4, yet, his 11 forced missed tackles in the run game are only three less than all other Seahawks running backs have combined on the entire season and is one more than Eddie Lacy and Thomas Rawls have on 51 more rushing attempts. In their first matchup of the season, none of the current running backs on the roster were able to force a missed tackle, but the 49ers have combined to miss the fourth-most missed tackles among all defenses with 80 and are averaging a missed tackle on 13.5 percent of their tackle opportunities. For the Seahawks, getting their running backs to five or more missed tackles will be the goal, as the 49ers are averaging a loss by 11.3 points when opponents’ running back do so. T Trent Brown vs. 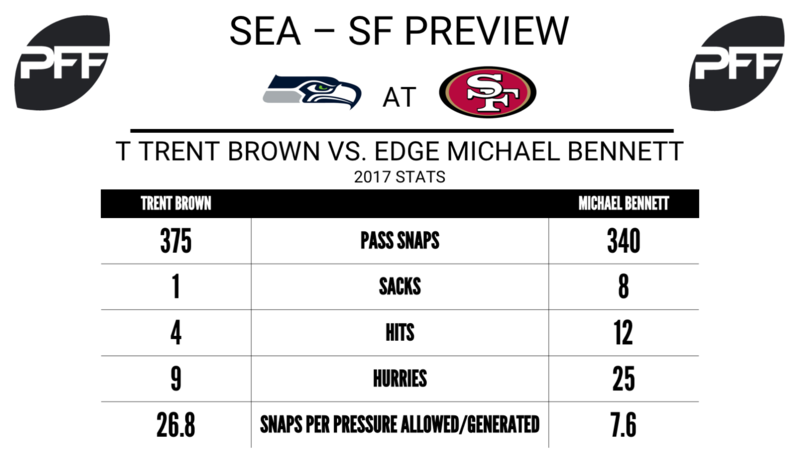 Edge Michael Bennett — Bennett will move all across Seattle’s defensive front, but he tends to do most of his pass-rushing from the left side of the defense (84.1 percent of pass-rush snaps), meaning he’ll spend a good amount of his day facing off against Trent Brown. When these teams played back in Week 2, Bennett recorded three total quarterback pressures (one sack, one hit, one hurry), but none against Brown, who finished the game with a clean sheet in pass protection. Though the Seahawks should hold an advantage in the trenches on this side of the ball, particularly on the interior, this has the potential to be the game’s best individual matchup. C.J. Beathard on throws outside the numbers — In Seattle’s Monday night loss to the Falcons, Matt Ryan earned the top grade given to a quarterback last week (89.2), and Ryan and the Falcons had a clear plan for how they wanted to attack Seattle’s secondary in the passing game. With the absence of Richard Sherman, Ryan threw heavily to the wide areas of the field, targeting 17 of his 27 passes outside the numbers while not attempting a single pass to the middle of the field traveling 10 yards or more in the air, staying away from the offices of Thomas and Wagner. For many reasons, this blueprint will be a difficult one for Beathard to follow. Beathard has struggled tremendously on passes outside the numbers this season, posting the league’s second-worst adjusted completion percentage (61.3 percent) and passer rating (56.0) on such throws. If the 49ers have any hope of pulling off an upset, Beathard must find a way to avoid the strength of Seattle’s defense and make throws to the outside. Carlos Hyde vs. Seahawks defensive front — Of course, the 49ers would love to keep this game close enough to rely on the running game and avoid having to put too much on their rookie quarterback. Hyde continues to be very good after contact — on zone runs (San Francisco’s preferred run concept), Hyde is averaging 2.90 yards after contact per attempt (sixth-best) and has forced 21 missed tackles (tied for second-most). He’ll need his A-game to approach that type of production this week against a Seahawks defense that has only missed 24 run tackles this season (second-fewest) while allowing a league-low 2.08 yards after contact per attempt.